The rhizome of the perennial herbaceous plant Polygonatum odoratum ( Mill.) Druce of family Liliaceae. Mainly produced in Zhejiang, Hunan and Jiangsu provinces in China. Plucked in autumn or spring. Long root, fat, white-yellow and lustrous. Sweet, slightly cold; lung, stomach and heart meridians entered. Nourish yin of lung and stomach, clear heat of lung and stomach. It is indicated for dry cough with little phlegm, cough with blood, and hoarseness due to yin deficiency, dryness in lung with heat, because it can nourish lung yin, and clear lung heat slightly. It is commonly combined with herbs of nourishing yin, moistening dryness, clearing lung and relieving cough. For instance, it is used with Bei Sha Shen, Mai Dong, and Sang Ye in Sha Shen Mai Dong Tang from Wen Bing Tiao Bian. 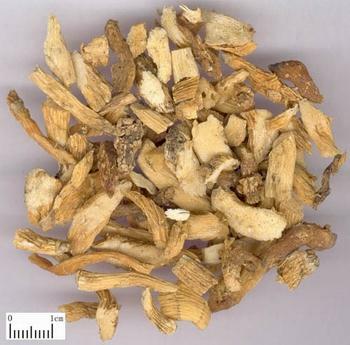 It i.s nourishing without affecting of pathogen, therefore, it is indicated for fever, headache, aversion to wind-cold slightly, cough, and dry throat with stagnated phlegm due to yin deficiency with wind-warm or winter-warm attacking, it is combined with pathogen-dispersing and heat-eliminating herbs, for instance, it is used wirh Bo He and Dan Dou Chi in Jia Jian Wei Rui (Yu Zhu) Tang from Chong Ding Tong Su Shang Han Lun. It can nourish stomach yin, produce fluid and relieve thirst and clear stomach heat with more drinking, hunger but no appetite, dry stool, no coating or red tongue with little fluid, or stomachache, distending in stomach, retching and other symptoms due to stomach yin deficiency. For dryness in tongue, thirst, hunger but no appetite due to yin hurt caused by heat diseases, it is usually combined with yin-nourishing, heat-clearing and fluid-producing and thirst-relieving herbs, for instance, it is used with Mai Dong and Bei Sha Shen in Yu Zhu Mai Dong Tang and Yi Wei Tang from Wen Bing Tiao Bian. For diabetes due to yin deficiency, it is combined with yin-nourishing, dryness-moistening and fluid-producing and thirst-relieving herbs, such as Tian Hua Fen, Tian Dong, Mai Dong and Sheng Di Huang. Besides, it is also indicated for syndrome of heart yin deficiency.